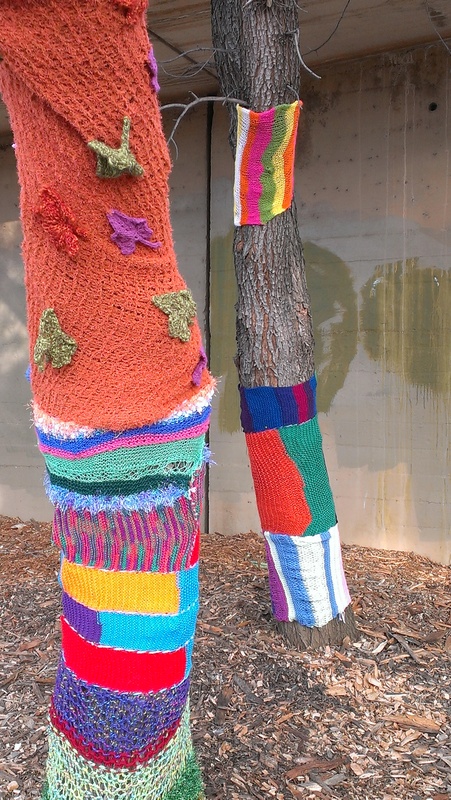 Guerilla Gardeners and Yarn Bombers Strike the Neighbourhood! 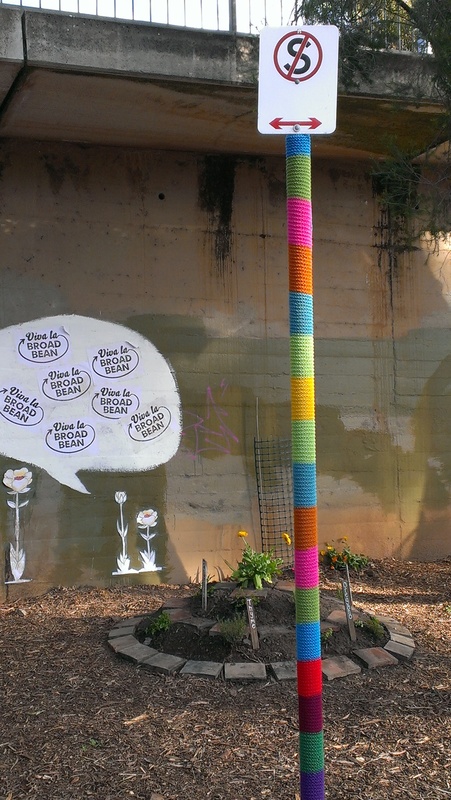 Yarn bombers have been out and about in our neighbourhood! They have improved a neglected spot a short distance from our place, cheering up people who’ve had a year of more construction noise, dust and reverse beeping than most of us can readily stand. Bless them! 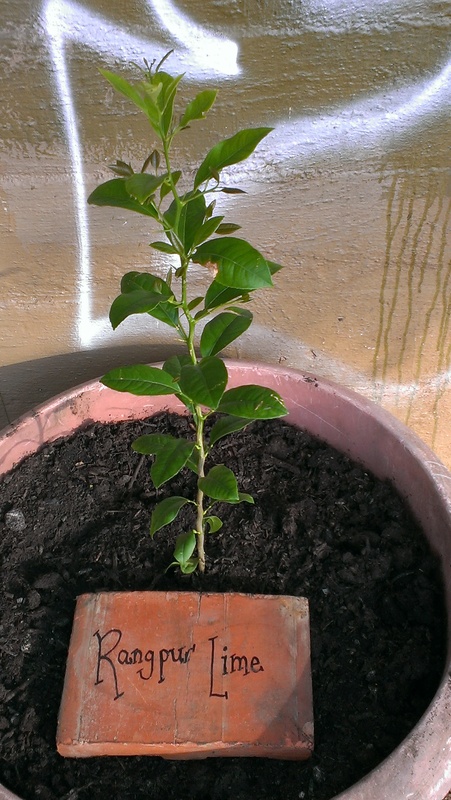 They even left a potted lime tree and a bougainvillea. I took a down-at-mouth neighbour along to see and she was quite cheered up by the constructive neighbourhood reclamation and whimsy of it all. So was I. 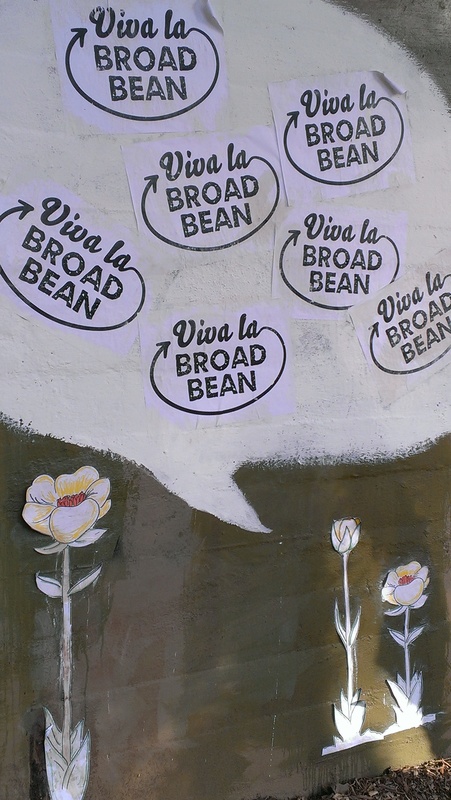 They go by the name of ‘Viva La Broad Bean’ and I can only congratulate and cheer them on. I met one of them when I went to take these pictures and congratulated her in person. I was able to share our neighbourhood revegetation projects with her, too. 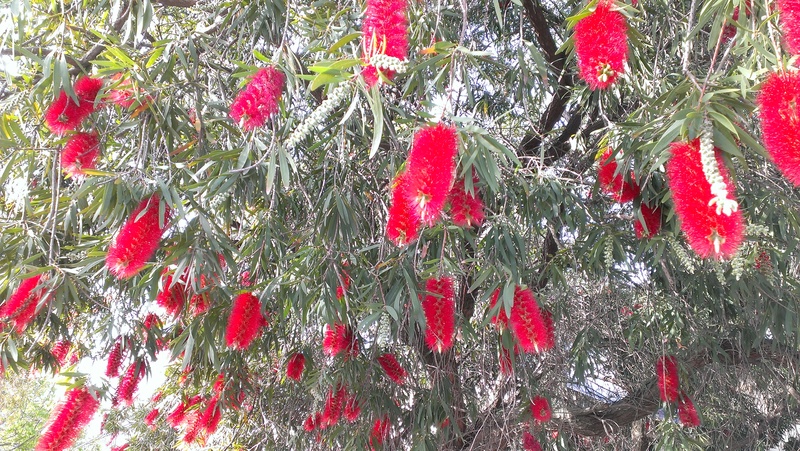 Meanwhile, the streets nearby are full of bottlebrush (callistemon) trees in flower. Thousands of blooms, each the size of an old fashioned bottlebrush–but splendidly red. It occurred to me that this is a form of wonder and beauty that non-Australians mostly don’t experience. The abundance of flowers has brought lorikeets into the neighbourhood to feed on the nectar and hold high pitched, apparently gleeful conversation. They don’t hang about to be photographed, but I managed to take a picture of this rainbow lorikeet before it flew off like a green comet. So cool! Recently, the power of woolly threads was demonstrated at an anti-military protest in Germany. Nine women rolled out a banner on top of the stairs of an army truck set up to attract new recruits. They also threw little balls of wool, criss crossing the stairs. When the police arrived, they rather climbed up at the sides than going through the wool! You can see some hilarious pictures here: http://www.dielinke-nrw.de/partei/arbeitskreise/frauen_lisa/unsere_kinder_kriegt_ihr_nicht/ Scroll down to the third-to-last picture to see clambering police… Such is the power of thread! How glorious! Thanks for the link! So cool! Yarn is not just cheery and colourful, but also quite powerful. The power of woolly threads was recently demonstrated at an anti-military protest in Germany. Nine women held a banner on top of the stairs to an army truck designed to attract new recruits. The women also threw small balls of wool, criss-crossing the stairs. When the police arrived, they climbed up the sides rather than walking across the yarn. You can see some hilarious pictures here: http://www.dielinke-nrw.de/partei/arbeitskreise/frauen_lisa/unsere_kinder_kriegt_ihr_nicht/ Scroll down to the third-to-last picture to see the police clambering. Such is the power of thread! Thanks for the lovely photos. 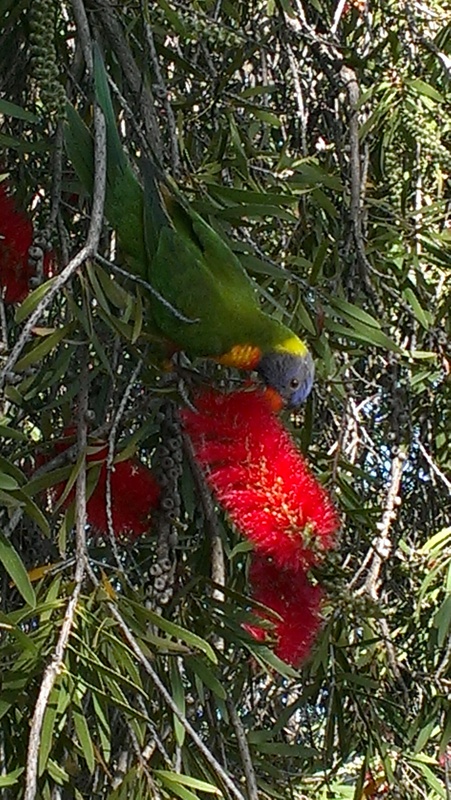 Loved the garden, the bottlebrushes and the lorikeets. What a great community we live in. Isn’t it a treat? Thanks Catherine. What a wonderful post to wake up to! I now have a grin from ear to ear! Glad to hear the neighbours enjoyed it. More to come soon, and hopefully we’ll be seeing more of your work throughout the neighbourhood as well. 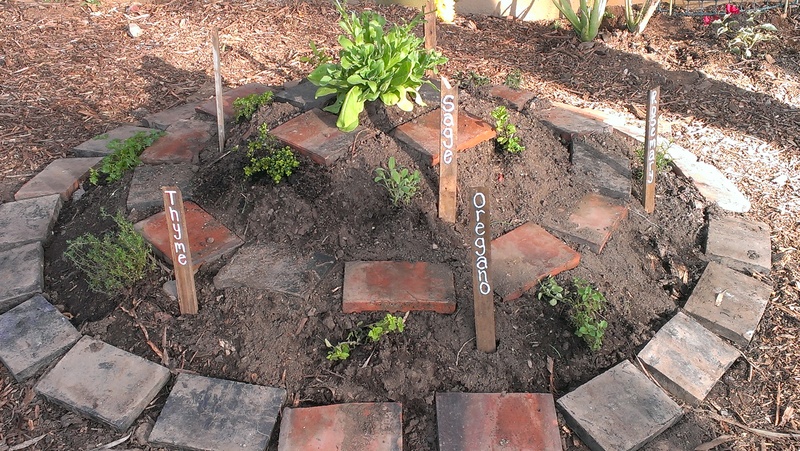 Beautiful blog, and absolutely beautiful projects… thank you for sharing with the rest of us. Thanks so much! I am continuing to enjoy your planting and yarnbombing… and hatching my own plans for when truck frequency down our street backs off. It’s a treat to have other people who think beautifying the neighbourhood is a good thing to do, so obviously present in the neighbourhood!